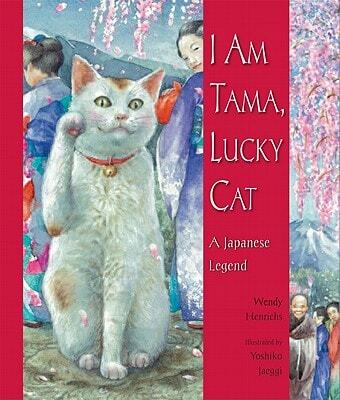 I am Tama, Lucky Cat by Wendy Henrichs, with illustrations by Yoshiko Jaeggi, is based on one of the versions of the Japanese legend of Maneki Neko, which literally translated means Beckoning Cat. Maneki Neko is also known as Lucky Cat, Welcoming Cat, or Fortune Cat. Heinrich’s almost lyrical style of telling the story, combined with Jaeggi’s absolutely charming illustrations, create a special magic. I found myself pausing at each page, absorbing the words, and losing myself in the pictures. The drawings of the cat capture feline body language and emotion purrfectly and make you feel like you want to reach out and touch Tama. This beautiful book is aimed at children ages 4-8, but I think adults will enjoy it equally as much. I’m giving away one copy of this book. To enter the giveaway, please leave a comment and let me know why you’d like to win the book. For an additional chance to win, share this giveaway on Twitter or Facebook and share the link in a separate comment. This giveaway ends Friday, August 5. July 26 update: Wendy Heinrichs generously offered a second copy for this giveaway, and she’ll even personalize and autograph it for the lucky winner! Unfortunately, the giveaway ended on August 5, but thanks for visiting. I love your site. I grew up in Germany. I didn’t realize that “Winkekatze” was the German word for the Maneki Neko cat. I would love to win this book. I had a beloved Tortie who has went over the rainbow bridge. I named her after a book called Tasha the dancing cat. Tasha was a very sweet cat. I would love to win this book. I’m a teacher, and we are going to focus on animals this year in school! This book would be a wonderful addition to my little library. I so love cats. I have 8 of my own, mainly because people seem to think they’re disposable and dump them off at my house. I have taken my love of cats (and animals in general) and started my own pet sitting business. I’m not getting rich doing it of course, but I love every minute of it. I would so love to have this book because it is about a cat of course, and because it fits in with my trying to be more positive in my life, and I am reading the teachings of Buddha in order to get to that point. When I meditate, which I have recently started doing, I often picture a cat in my mind. They are so Zen-like. I’d love to win a copy of this book because I have known Wendy since our children were little and I know she has to be a terrific writer because she is a very special lady! I am so happy for her getting her work published! Great book! My neighbor’s kids love cats but are still learning to be gentle…maybe this book would help! I would love to win the book because I collect maneki neko cats and I have a few real cats, too! We love to read about cats and this book sounds like a good read. What a fantastic giveaway response! I’m so glad you liked I Am Tama! Good luck to all the giveaway entries! I’d like to win this book for my nieces, who love animals and books about them. I also appreciate the Buddhist teachings. Oh – and as Lyn5 said above, I, too, had a “wasting” cat that I nursed back to a good life with me for an additional 7 years. After Sneakers survived all that, he died from a malignant sinus tumor. Broke my heart. I’d seen a review of this book and thought I might buy it, so when the contest showed up on Conscious Cat I thought it was a sign! I have a number of maneki nekos, including one brought back from Japan just one day before the quake and tsunami. However. after reading some of the entries above, I think it should go to someone more deserving. You have a lot from which to choose! Good luck to everyone. Shared on Facebook for another entry!! Yeah, I really want to win, LOL. (I don’t know any other way to give you the link than to my profile though). I want to win because I love the Maneki Neko!! I wrote an article about it for a website (not my RPO blog). There are many different versions of the story. In 2006, an artist painted my dear Sneakers as a Maneki Neko, and he had good fortune for two years as he battled pancreatitis, IBD and an inflamed liver. He was down to 5.25 pounds in early 2006 and got up to 9.75 pounds a year later. (I was told that a wasting cat never comes back. Sneakers and I proved the vet wrong!) I have total respect for the Maneki Neko spirit. It sounds like a great attention-getting book for children. My great nieces and nephews will love it and the ones who can read will get pleasure from reading to their younger siblings. This would be wonderful for my granddaughter, she LOVES kitties! I would love to win this book, since I adore cats. I believe all cats are a little piece of heaven on earth. They bring us unconditional love. I have a kitty who means the world to me. I would love to win this book! Sounds like a really good book and I love cats! Buddhism and cats are a particularly appealing match for me. Good to have they ‘presented’ to children. Oh, my, I think I need to study the art, writing and design of this book in addition to simply enjoying the story and the pleasure of the lessons of the Buddha. 1. I have a cat named Tama after this legendary cat. 2. I am of Japanese heritage. 3. I collect Maneki Nekos. 4. Needless to say I LOVE cats! I am a Buddhist and cat rescuer. I have 10 cats just now and feed several outdoor kitties. People often berate me because I would rather see the cats well fed than worry about myself. A Tibetan Buddhist teacher once told the story of a student who was presented with an opportunity to rescue a dog. He refused, so another and yet another dog appeared and yet he never got the message. I want to win so I can read it with my kids. We LOVE to read about cats! My boy Joey and I are both cat lovers, and I would love to share this book with him! And shared on my Facebook page… Thanks! Because i am of Japanese heritage, I would love to add this book to my collection of cat and dog books. I want to win this book because I’m a really big cat lover!!! !